The symbol of the Chinese lucky cat is one of the most iconic in the world of feng shui. Just by its name alone, it is easy to determine why the lucky cat has gained such popularity not only in the Eastern feng shui tradition, but now also in the West. Its reputation for bringing luck and prosperity to those who know how to use it has made it a welcome addition to many a home and business. Despite the ubiquity of the Chinese lucky cat in many businesses and residences that employ feng shui practices, using this symbol is not simply a matter of purchasing a lucky cat and placing it wherever you wish. There are certain practices that surround the use of this tiny figure in terms of feng shui that you should know about before you get started. The proper use of this object will ensure that you understand how it works within feng shui. Although the figure is referred to as the Chinese lucky cat, it actually originated in Japan. Its Japanese name is "maneki-neko," which translates to “beckoning cat.” The statue likely originated in either Tokyo or Kyoto sometime during the Edo period (1603-1868), and became popular by the turn of the 20th century. Its name describes the position it takes, with one paw held aloft in a gesture of beckoning. In fact, many of the plastic and ceramic statues available are made in a way such that the beckoning paw is able to rotate forwards and backward, as if it were knocking on a door. Some of these even use motorized arms or solar power to make the statue's paw move. Beckoning would indicate a gesture of inviting someone to approach, and yet the statue appears to be knocking, as interpreted in the lexicon of gestures known in Western world culture. However, in Japan, the hand gesture that this calico Japanese bobtail cat uses is easily recognized as being a gesture of beckoning. Folktales claim that the statue may resemble the gesture of a cat washing its face, which was linked to a Japanese belief that a cat washing its face was a sign that a visitor was going to soon arrive. Hence, the Chinese lucky cat is placed as a good luck symbol, but also as a way to attract visitors and customers, especially in places of business. 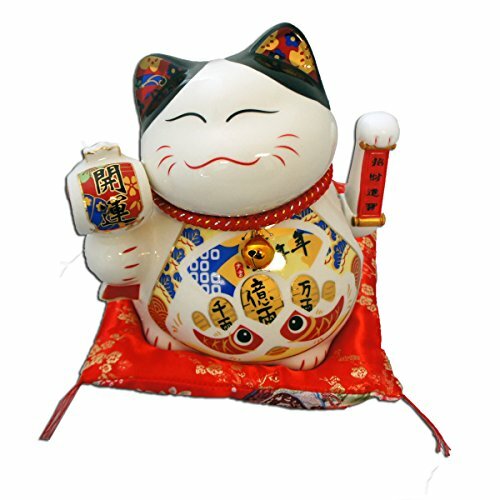 Before you get started using your maneki-neko in your feng shui plan, you will have to choose the right one for you. There are many types available on the market, and different colors have different meanings. Taking a moment to think about the exact benefits you wish to gain from your Chinese lucky cat and how the colors may relate to those desires can help you decide which type of statue to purchase. Perhaps the most common color combination for these statues is the tri-color version in red, green, and white. These are said to attract overall wealth, prosperity, and abundance. A white cat is one of the most common forms of the statue. White is a color of purity and thus, it can attract purity to the environment where you place it, enhancing harmony and happiness. Gold cats are also common. Given its association with attracting wealth and commerce, a golden Chinese lucky cat emphasizes the money-making aspect of this talisman and can be chosen in cases or in locations where you wish to increase income. 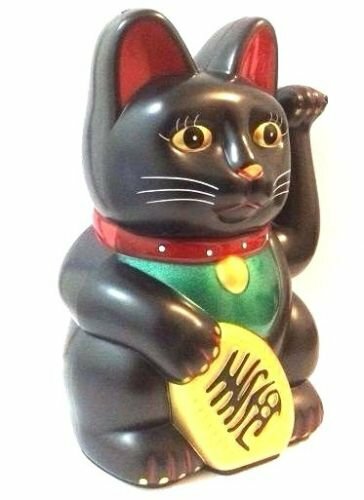 Sometimes the cats come in black, which is a strong color that, in this statue, can help you repel negativity and evil. The black Chinese lucky cat is said to work in terms of protecting the space and acting as a sort of guard against bad energy. Red is an auspicious color. A red cat is said to help with vitality and well-being, so it is a good choice if you wish to ward off illness and encourage health. The size and material of the cat statue also play a role in your choice. These statues come in all sizes, from small to large, as well as materials ranging from lightweight plastic to heavy ceramic. Consider the location where you want to place your statue and how visible you wish for it to be. You may encounter a Chinese lucky cat statue with its left paw raised and beckoning, while others may have the right paw raised or even both paws raised. It can be confusing to know which one is best for you to choose. Generally speaking, the left paw is an invitation for wealth and prosperity, while the right paw helps ward off negative energy and can serve as protection. Feng shui, which is sometimes also referred to as geomancy, is an ancient Chinese practice that uses the placement of objects within a space to create certain energetic benefits in the space. It aims to harmonize the flow of energy within a space and takes into account how various elements operate within a particular space. Balancing polarities, such as the active and receptive qualities of yin and yang, is an important factor in this practice to bring harmony to the environment. In Western forms of feng shui, practitioners use what is known as a bagua map to place the various areas of a home or business within the grid representing nine different areas of life, such as wealth, family, and career. By using a bagua map, a person can understand how the placement of rooms in a home or office and objects within those rooms relates to the desired outcomes to work toward them rather than against them. In the classical feng shui bagua, the wealth area is the southeast area of the space. The location you choose to place your lucky cat will depend a lot on where you want to increase the effects that the cat can bring to your life and your environment. The placement of the lucky cat is known as "activating" a space, as once the cat is in place, its properties are considered activated for that particular area or purpose. One of the most common uses for the cat is to draw in wealth and prosperity. If your work revolves mainly around a desk or in a particular office space, you may wish to place a Chinese lucky cat on your desk or in your office for drawing in clients, more work, and improved income. If you know based on a Western bagua grid which part of your home or office is located in the wealth square of the grid, you can place a Chinese lucky cat in that sector of your home or office to increase the power to attract wealth and prosperity. One of the most typical locations for the placement of a Chinese lucky cat in a place of business, if it is a retail business, is near the cash register. This is because the statue would enhance the accumulation of money and draw more to the register. One of the cats with a motorized or solar-powered paw or two paws that are in continual motion keep the energy flowing around this area and are said to therefore actively encourage customers and sales. Another auspicious area to place the cat statue in your retail business is in the front shop window. It can catch customers as they walk by and beckon them inside. You may often see this used also by restaurants to encourage diners to come in. Remember that the cat is used to draw people, customers, visitors, wealth, and positive/abundance energy into a space, so you should ensure that your statue never faces away from an entrance or toward a wall. As its purpose is to beckon and invite good fortune, place the statue in a way in which it welcomes all of this into your space. ​You can enhance your statue's energy by adding some small symbolic modifications. For example, you could put bells around the cat's neck to further ring in and welcome wealth and prosperity. Placing coins around the cat or giving it a small money bag can also enhance its wealth-attracting power. Another important factor to consider when you decide whether to use a Chinese lucky cat to attract wealth and prosperity is how you feel when you look at it. The cat you choose should make you feel happy and be an object you enjoy looking at and having in your space. This type of feng shui cure has been used for hundreds of years by people in both the East and the West to attract customers, business, visitors, and good fortune. 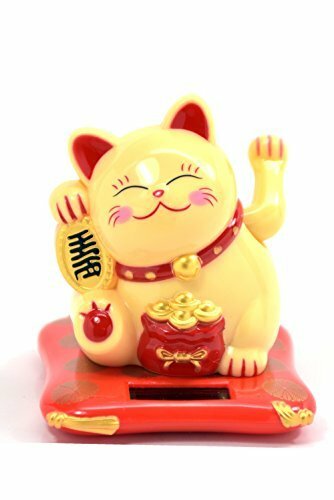 Now that you know how to use Chinese lucky cat in feng shui, you are ready to let the positive energy flow.